I have had a long-term relationship with Joyce Maynard. It goes back to the 1970’s. Joyce does not know me and has no idea as to who I am. Yet she has influenced my life and thinking for over forty years. I first became acquainted with Joyce shortly after I graduated from Pitzer College in 1975. It was not long after I went to work at B. Dalton Bookseller when I read her 1973 book Looking Back: A Chronicle of Growing Up Old in the Sixties, expanded from an essay that appeared in the New York Times Magazine. I felt an immediate and deep connection with her and recognized that we shared many of the same values about growing up, leaving home, and heading out into the world. The book touched me deeply as I was leaving the sheltered world of academia and figuring out how to buy my own groceries and pay my own rent. At that time I had no clue that she was the 18-year-old who had moved in with J.D. Salinger. I was disappointed, therefore, to hear Joyce’s commentaries for the Spectrum series on CBS radio. Back in those days CBS radio had a rotating group of commentators who offered short audio essays on current affairs. Joyce always took the conservative perspective, very much at odds with her viewpoint in Looking Back. I was further disappointed, devastated, and hurt, I felt stabbed in the back, when I read a piece of hers, I don’t remember where, in which she wrote that what she said in Looking Back was not what she really felt but what she believed readers of the era wanted to see. Joyce, how could you? In spite of this betrayal I paid attention when I saw her name, and I was compelled to buy and read her 1998 “tell-all” book about her life with Salinger, At Home in the World. I felt sympathy for her naiveté and ineptness, but she wrote nothing to heal the original betrayal. Joyce resurfaced recently, when I turned the page of the September 9 New York Times Book Review and saw her name on a full-page essay. She notes that twenty years have passed since the publication of At Home in the World. She reminds me that we are very close to the same age (there’s only three months difference, in fact). She writes of being ostracized by the literary community for the perceived betrayal of Salinger in her book, and about how, after all these years and after all of the novels and other books she has written over the decades, she is still most remembered, by some at least, for her brief relationship with Salinger. I feel a certain sympathy, even some empathy for her. But Joyce, you still betrayed me more than forty years ago. I should be over all that, I know. The truth, nonetheless, is that I hardly knew ye. I hope you saw my blog entry on immigrants and food. If not, please do take a look. There’s more on television on this topic. PBS has a new program called No Passport Required. It is hosted by chef Marcus Samuelsson. Samuelsson was born in Ethiopia, adopted, and raised in Sweden. He immigrated to the United States where he has become a successful restaurateur, cookbook author, and television personality. The program is similar to the show Eden Eats, about which I wrote, in that Samuelsson visits a different city in each episode. 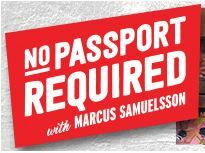 Unlike that program, however, Samuelsson visits a single ethnic group in each city, and No Passport Required is a full hour rather than half an hour. This gives him time to delve in-depth into each immigrant community. Another PBS program, related to immigrants though not necessarily food, is “Ellis Island” on the Great Performances series. Composer Peter Boyer combines orchestral music, photography, and the spoken word to provide a moving portrayal of immigrants coming to the United States in the early part of the twentieth century. Boyer says he did not have the immigrant situation of 2018 in mind when composing this work, but he certainly sees the relevance. The program aired on television at the end of June. You can to stream it or watch on demand until July 27. Make sure you have a Kleenex within reach at the conclusion. I am sick of, and I am sickened by, the attitude the current administration takes towards immigrants. All of us privileged white middle class women and men are descended from immigrants. It’s just that some immigrants have arrived in the United States more recently. Immigrants who come to America, legally or illegally, start and succeed at more small businesses, send a higher percentage of their children to college, and commit far fewer crimes than natural born Americans. There’s more. But you get the point. Cities and towns of all sizes are home to restaurants that we patronize and enjoy. Here in Hemet we have Mongolian, Japanese, and Thai cuisine, with an Indian restaurant due to open soon. They are run by hardworking individuals who are often underappreciated. Fortunately there are those who understand and value this. 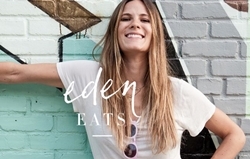 Eden Grinshpan is the host of Eden Eats, a short-run program that originally aired on Cooking Channel. You can still find the series on the Genius Kitchen app. Each week Eden visits a different U.S. city and seeks out the best immigrant food. When she went to Austin Eden didn’t go near TexMex or festival food. What she did do what visit an Ethiopian restaurant and an European bistro run by a Hungarian family. She partied with the Austin Filipino community and then visited a Lebanese bakery and a Cuban café. When she did seek out Mexican food she found a food truck whose owner serves authentic Mexican dishes from the interior. Then there is Penzeys Spices. Owner Bill Penzey is a long-time champion of progressive causes. He speaks out against gun violence and in favor of teachers and marriage equality. He has also taken a strong stand in support of immigrants and the value and richness that they bring to this country. He has made some very generous promotional offers to underscore his belief that immigrants add to rather than detract from the fabric of our American society. 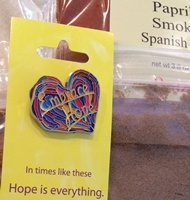 Many of his spice mixes reflect the diversity and breadth of flavors around the world. Let’s set aside bigotry and ignorance. Instead, let’s pause and take a moment to remember all that immigrants contribute to this country. This week I am remembering that it’s been fifty years since the assassination of Robert Kennedy. I wrote about this on Wednesday. That brought to mind Dion’s classic song. Robert isn’t included in the title, but he is remembered in tear-inducing final words of the song. We must continue to carry the flame. I want to acknowledge that today is D-Day. That’s important to remember. It is especially on my mind this year as I am reading a book on the literary and art scene in Paris between 1940 and 1950. It was not long after D-Day that Paris was liberated, though the war would go on for another year. But more on that down the line. What is on my mind today is what happened fifty years ago. 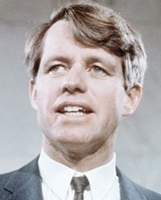 On June 6, 1968 Robert Kennedy died. He was shot in the early morning hours of June 5 after declaring victory in the June 4 California presidential primary. I had a paper route in those days, and as Don McLean sang about how he and his paper route intersected with events in the larger world, so did I and mine. On Wednesday June 5 I got up, as I always did in those days, at 5:00 a.m. to fold my papers and I was not completely awake. The assassination was late enough that it was past the deadline for the main front page news story, but still early enough that the editors could pull out the promotional material above the masthead and replace it with a large headline: “Kennedy Shot” and a few paragraphs about what was known at the time. Below the masthead was a headline that reflected Kennedy’s victory in the California primary. It was very disorienting and it took me a little while to process what had happened. I have a hard time believing that it has been fifty years. It has been though. And it was one of those events that changed the course of American society. There is a story going around, a story that has been going around for some time, that Fred Rogers of Mister Rogers’ Neighborhood fame was a Navy Seal, and that he wore long sleeves on his television show to hide his tattoos. 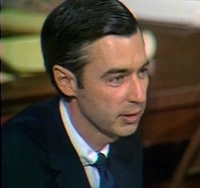 Although he was friendly with the children in his viewing audience and talked to them on their own level, he was most definitely an authority figure on a par with parents and teachers (he was Mister Rogers to them, after all, not “Fred”), and his choice of dress was intended to establish and foster that relationship. If you need any more proof, check out the movie trailer for the upcoming Fred Rogers documentary. It shows scenes of him in short sleeves playing on the street with youngsters, not to mention a brief moment picturing him underwater in the pool wearing only swim trunks. Not a single tattoo in either case. This is, perhaps, much ado about nothing, but I am guilty of spreading this urban legend, so I wanted to set the record straight.